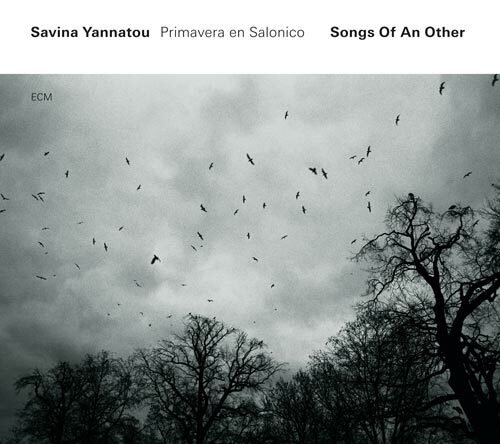 Songs Of An Other marks the third point of contact between Greek singer Savina Yannatou, along with Primavera en Salonico, and ECM. The program is more geographically varied than ever and emphasizes the interpretive prowess of its musicians. Much of that prowess breathes through Primavera’s superb control, for while the album boasts moments of sportive extroversion, it upholds the music first and foremost as a model for emancipation. Indeed, Songs Of An Other, shows this collective at both its most animated and its most delicate, oftentimes within the same song. Both the slack-stringed “Za lioubih maimo tri momi,” which comes by way of Bulgarian Macedonia, and “Radile” (from Greece) run the line of straight-up folk and all-out jam. In the latter vein, two new tunes based on Greek sources add another line to the project’s résumé. “O Yannis kai O Drakos” is a dragon-slaying song replete with fanciful colorations, paroxysmal gasps, and subtly frenetic bassing. “Perperouna,” a call for rain, explores the gravelly pits of Yannatou’s voice, embraced by the windy brine of nay and kalimba, all moving in a Celtic knot of rhythm toward an adlibbed comet’s tail. Even the “Albanian lullabye” becomes a ritual of ululations and incantations, honing a mysterious and strangely accessible edge. For much of the album, however, the musicians tread a delicate path, adapting to every dip in Yannatou’s tightrope along the way. From the dulcet “Smilj Smiljana” (Serbia) to the Italian olive-harvester’s song “Addio amore,” they emote lucidly. Combinations of flute, violin, and accordion cloud like ink in water in “Sassuni oror” (Armenia); dances take the night by the hand in “Dunie-au” (Kazakhstan); and the 16h-century Yiddish traditional “Omar hashem leyakoyv” is practically translucent in sentiment. The greatest accomplishment of Songs is the fullness with which it romanticizes, as is clear in “Sareri hovin mermen” (Armenia). Given the “Eastern” feel, one might easily read into it an alluring sway. Likewise, “Ah, Marouli,” a Greek song about sponge-divers on the island of Kalymnos, sashays with seeming invitation. And yet, these arrangements are so emotionally (and physically) complete that they hardly need even these words to convey to the uninitiated listener the magic of their self-assurance. And that’s the thing: every step and element of this audible alchemy is as lucid as the light that illuminates the talents of these fine instrumentalists, Yannatou tracing them all the while as a wave might shape an Aegean breeze.